Hybrid Play comes with two custom designed games: Puzzle City, and Space Kids. create your own games. Your creations, your rules! or experience zero gravity by playing on the swings. Find puzzle pieces to discover what is missing in the city. learn what city spaces are meant for. or help Pac-man to scape by moving your body on the sewsaw. Transform classic games into something new with Hybrid Play. What could a playground become? Places to discover and adventures to enjoy. Games created for kids, by kids. Hybrid Play is an open project. That´s why we want it be easy for anyone to make their own Hybrid Games. We are working to connect Hybrid Play with easy to use visual programming language (VPL) easy to use. This way kids, parents, and educators can create their own videogames for the playground. Make your own games with Gamesonomy. It´s simple to use even without programming knowledge. Gamesonomy is a powerful tool to create games through a web interface. 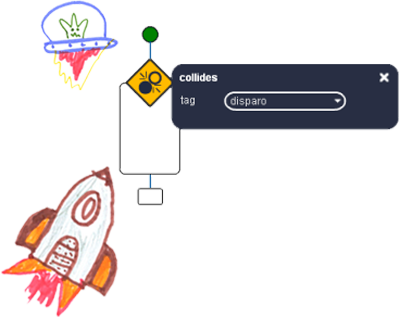 Because Gamesonomy is a VPL you can create the environment, actors, and everything elese in the game visually, using tags and conditions. Forget about physics or messing with code, you can create platformers, action, or even strategy games easily. Contact us if you are interested in developing a Hybrid Play Game. We´ll invite you to test the sensors and experience a real Hybrid Play game in the playground. We`ll also help you make your game compatible with Hybrid Play, and explore all the possibilities of playground games.